Summer is officially over. This generally means that children have returned to school, and we are all trying to adjust and get back into a new routine. For me, that routine consist of refocusing my mindset. Part of that refocus is finding time for fitness doing 20 minute workouts. There are so many different options out there for fitness, so knowing what works and where to focus your energy can seem very difficult. Time, money, and physical ability are all things that get taken into consideration when fitness is involved. What I am sharing with you today is only 20 minutes, free and any one at any fitness level can do it. Many of us hold back because we don’t think we have the strength to do specific workouts. We want it to be easy from the get go. Putting in the work can be scary at times, and does require some sacrifice from our bodies. Fear can hold us back, therefore crippling any chances we have to make a change in our life. But we have to start somewhere, doing something for change to occur. Right now in my life, time for myself is something I am struggling to find in my day to day. I have found that spending 20 minutes a day doing intense interval training has been the best for my body and given me the endorphin high I need to boost my energy and feel good. Not to mention the results of the workout are very positive. 20 minutes a day, that is all it takes for me, and could possibly be the right option for you as well! Fitness is about improving, becoming stronger, and healthier overtime. 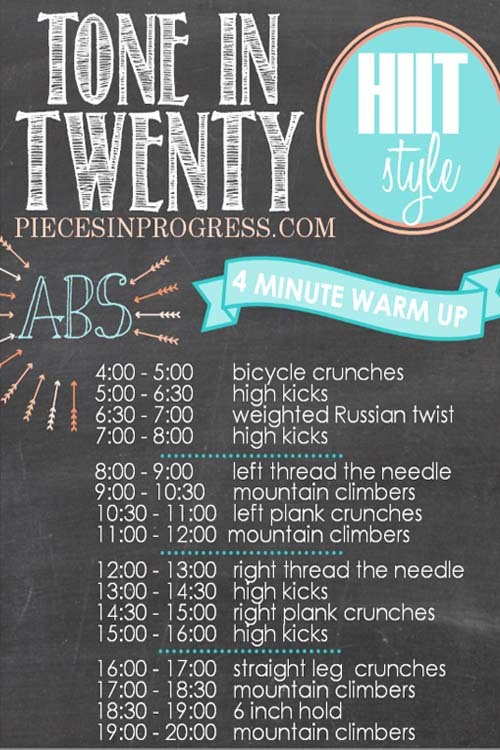 I have put together some of my favorite 20 minute workouts that I found on Pinterest for you to try. Each workout is set to show improvement overtime. They may have a level of difficulty that you are not be comfortable with right out the gate. That is okay. Do what you can and moderate the movements when needed. Remember, it is about improving and becoming stronger. Track your workouts each week. Write down how many sets you accomplished so you can improve your numbers overtime. Anyone can do anything for 20 minutes. Get out of your head, think positive, and push your limits. Let’s GO. 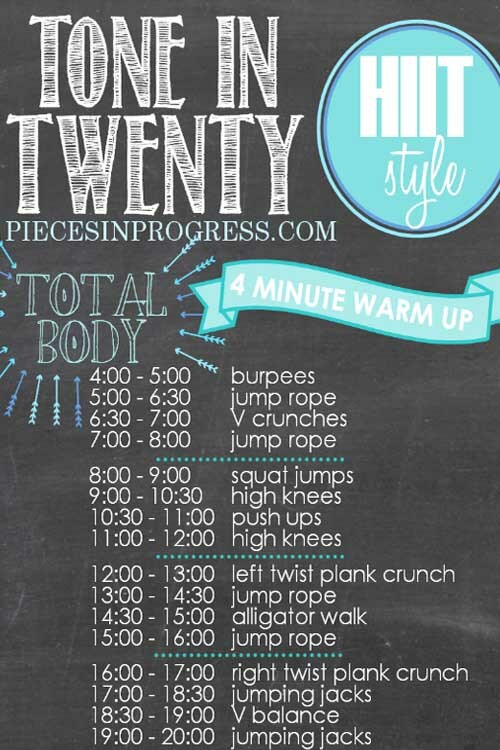 This 20 minute workout allows you to mix up your workout each and every time. Track your progress by recording the workouts you are completing and how many repetitions you were able to complete in the allotted time. Improvement will be easily tracked and easily seen if you dedicate yourself and push hard. Cardio is a hidden gem to toned muscles and greater lung capacity. 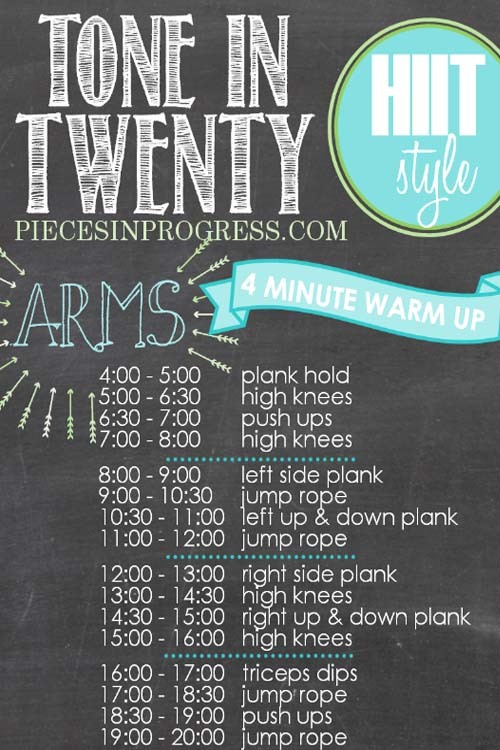 This 20 minute workout is certainly one that will make you sweat and breath heavy. The beauty of this one is that you are working in 30 second rotations. I recommend going through the circuits in order, and then repeating it 3 times. These four workouts give you everything you need, plus some. Focusing on head to toe goals, each workout targets a specific area of your body. Muscle toning and cardio endurance will be the benefits of these workouts. Using these workout suggestions, you now have the ability to get a great workout six days a week. I would love to see what your workout schedule looks like incorporating these 20 minute workouts. Share your thoughts and feedback on the post below. For a fun 3 minute warm-up or cool-down, click here!